Nb. The Google map may have problems loading in Explorer. Use Safari/Firefox for better performance. Social Souvenir is a social product and installation by Danish designer Sebastian Campion. Each T-shirt is imprinted with a text fragment inspired by 15 renowned artists represented in the museum's collection, such as Yoko Ono, Erik Satie, Marcel Duchamp and Per Højholt. Visitors can buy a T-shirt of their own choice, the only condition being that they share a bit of personal information about themselves, or more precisely: their name and address. 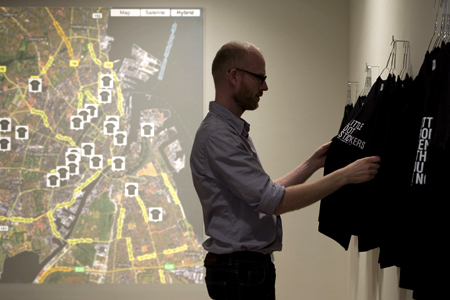 When paying for the T-shirt at the museum-shop, the information is mapped in Google Maps, thereby making it possible to see where each T-shirt ends up after leaving the museum. During the course of the exhibition, the 300 T-shirts will gradually disappear from the physical museum space only to re-appear on the web. Consequently, by buying a T-shirt visitors do not simply get a personal piece of the installation - they also help contribute to its collective development and distribution. 1) To re-activate the museum's collection and make it available to the public in a new way using new forms of media. 2) To create social links between (random) museum visitors, thereby creating a stronger sense of community. Social Souvenir takes part in the exhibition TOTAL_AKTION - Art in the Landscape of New Media, running from Oct 3 - Dec 21 2008 at the Museum of Contemporary Art / Museet for Samtidskunst in Roskilde Denmark. Remaining T-shirts will continue to be sold at the museum. A projection of the map is updated when a t-shirt is sold. 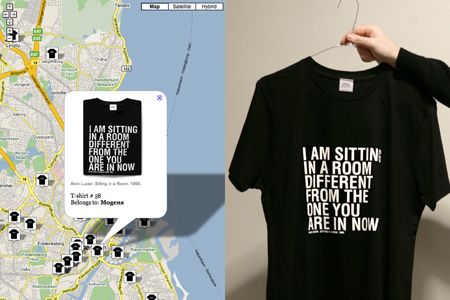 On the web, people can see who else bought the same T-shirt as themselves (may not work in Explorer). 2. Before paying: Share a little personal information. 3. At home: See who else bought the same T-shirt as you. Social Souvenir by Sebastian Campion. 2008. Commissioned by The Museum of Contemporary Art, Denmark.